Home Safety Stay Safe in the Heat! Summer’s coming, so we thought it was about the right time to share what we know about keeping cool at work, as the temperature rises. It’s all too easy to think that all you need to do is lather on the suntan lotion and you’re good to get out there, but it’s not always that simple. Although a lot of jobs are outdoors and do require that you take plenty of precautions if you’re going to be exposed to the sun all day, a bigger danger present in most lines of work is heat stress. And that can happen outdoors, working on the construction sites, in maintenance, landscaping and agriculture, but it is an indoor problem too. If you work in commercial kitchens, laundries or factories, you need to take care this summer. Why? Well according to OSHA, thousands of workers fall ill with heat stress every year. And if its not taken seriously, it can even kill. First up it’s really important to recognize when it’s happening, what the danger signs are, then you can deal with them before they become a problem. Wherever you’re working, if you’re exposed to high air temperatures, heat sources, high levels of humidity, or strenuous activity in hot conditions, you’re going to naturally run the risk of a heat related illness or injury. As your core temperature rises, as your muscles move, your heart speeds up, and even a few degrees difference can affect your ability to think straight and perform effectively at work. And that can manifest itself in many different ways, from feeling faint, heat exhaustion, heat cramps, heat rash, and even heat stroke. Now we all know that under normal circumstances your body sweats, in order that your core temperature comes down, but when the air’s too warm, and the humidity is too high, that doesn’t happen. 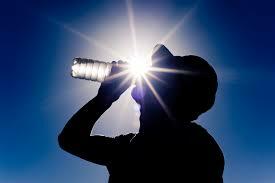 You’ll be losing fluid and your salt levels will be lowered too – and that’s when we see injuries and heat illnesses. So, what can you do? Many things actually. And under OSHA regulations, you have the right as a worker to receive training and education on hazard awareness and avoidance. And if you’re lucky enough to have a good employer, just asking them might get you the training and preparation you need to be safe this summer. But here are a few tips you can bear in mind, because recongizing the symptoms and proactively preparing to avoid them can save your life. Recognize the signs – hot, dry skin, sweating, hallucinations, chills, a throbbing headache, high body temperature, nausea, clammy skin, looking pale or flushed or having muscle cramps are all indications that you should stop and cool down. Wear the right gear – wear cool, comfortable clothing whenever you can. There are some great brands out there making products specifically for the hot weather, with new and innovative solutions to the problems of heat stress. As well as hats and sunscreen, think about brands like Occunomix and Ergodyne. They both make bandannas, hat linings, and towels that when soaked in cool water, will stay moist for the whole day, helping you to keep cool and stay safe from the heat. Eat and drink properly – Avoid alcohol before a day out in the heat. You don’t want to start the day dehydrated! Also, avoid coffee and sugary drinks – stick to good old water. Don’t stay in the sun too long – think and work smarter. If it looks like tomorrow’s going to be extra hot, maybe do some of those jobs you can get done indoors first. There’s always tomorrow, especially if it’s going to be cooler up on the roof! Keep an eye out for each other – if you’ve got a new person on site with you, they’re probably not so used to working in harsh conditions, so it’s always good to keep an eye out for signs of heat stress. And try not to load too much too soon onto those guys, they’ll thank you for it by showing up again tomorrow! And finally, make a plan – make sure that if heat stroke strikes, you know what to do. Make sure you can safely remove that person from the site, or wherever you’re working and get them the help they need fast. All of these tips will make sure you’re one step ahead and on top of the weather, before it gets on top of you. And you can check out our whole range of cooling products at Working Person’s Store. You’ll find hydration packs, cooling work vests, hard hat liners, chilling towels, cool boxes for your food and drink, sweatbands and more. Everything you need to work safe, work cool, and work smart. Stay ahead of the game this summer, but most of all, stay safe. Heat stress is real and it’s something we all need to think about. So if you have any questions about heat stress then please, feel free to ask us and we’ll do all we can to advise you about the best ways to stay cool and point you toward the products that can help you do it too. Previous articleWear the Right Socks!